Item #GS-815: 2" x 2.25" x .625" black Limestone turtle with gold Chalcopyrite veining. Item #GS-922: 2.75"x3.25"x1" light purplish Blue Chalcedony beetles on brown and tan matrix leaf. Item #57: 2.5"x3.25"x1" tall light purplish Blue Chalcedony Beetles on Brown Matrix Leaf. Item #GS-918: 2"x2.25"x1.625" purplish Blue Chalcedony birds in brown matix nest. 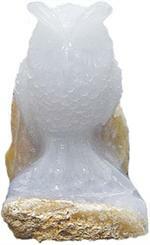 Item #GS-919: 2"x2"x1.875" tall purplish Blue Chalcedony Birds in Brown Matrix Nest. 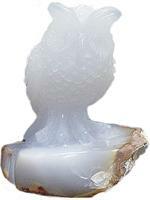 Item #2: 2.5"x1.5"x2.375" tall light purplish Blue Chalcedony Owl on Brown Matrix. 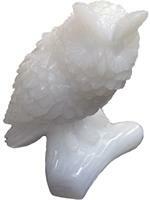 Item #3: 1.5"x1.5"x2" tall pale Blue Chalcedony Owl perched on a limb. 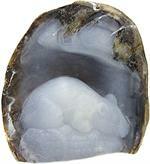 Item #GS-560: 1.375"x1.75"x2.5" light purplish Blue Chalcedony on brown matrix. Item #GS-921: 1"x2.25"x2.25" light to medium purplish Blue Chalcedony rat on ear of corn with brown matrix. 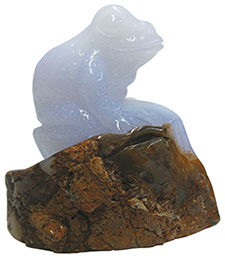 Item #GS-920: Blue Chalcedony Rat with Nut. 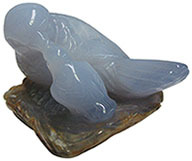 Item #40: 2.5"x2.25"x1.25" light purplish Blue Chalcedony turtle on cream and brown matrix waves. Item #GS-925: 1.5"x2.5"x2.25" light purplish Blue Chalcedony turtle on waves. 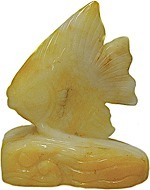 Item #115: 5"x5.5" tall White and dyed Yellow Chalcedony Fish.